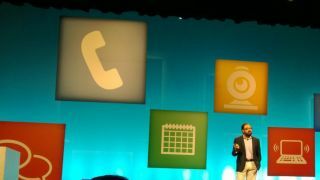 Microsoft made a lot of announcements at the Lync conference this week. First up, it's adding an Android tablet Lync client to the iOS, Windows Phone and Windows clients that are already available. It's also bringing voice calls and large meetings to Lync Online. Elsewhere it's letting businesses offer free Skype calls to customers, and letting you make HD video calls from Lync to Skype or to legacy video conferencing systems like Tandberg. They're all different ways to enable what Microsoft is calling not just unified but Universal Communications. "Universal is about enabling anybody to communicate with anyone else," Giovanni Mezgec, the general manager for both Skype and Lync told TechRadar. Some of those pieces arrive this year (the Android tablet client will be on Google Play by the end of June, and video calls between Skype and Lync come later this year). Others take longer, like adding voice to Office 365 or connecting up to social network conversations in Yammer, neither of which are likely to happen this year. Using what Lync knows about you to put the person you're about to have a meeting with at the top of your address book is going to take longer still, but partners like Plantronics are adding some clever features already. If you walk away from your PC, for example, your Plantronics Lync headset is smart enough to send an incoming call to your phone instead. The original idea of Lync and its predecessor, Office Communications Server, was that you didn't have to think about whether you wanted to use a phone or a PC to talk to someone, you just used the software and let it figure out how to make the connection. In Office 365, Lync Online has only let you do that fully if you also paid for a service from a voice provider like BT. Those partner services will still work, and partners will be able to take Office 365 and Lync and add extra services and sell you that. But if you just want to make and receive landline calls through Lync Online, in future that will be built into Office 365. You'll be able to call a phone number from Lync or have people call a standard phone number and have the call come to you in Lync on whatever device you're using. "It fits right into universal communications," Mezgec points out. "We want to make sure people get access to communications on any device and when you connect with the cloud, you want to connect with as many people as possible." If that sounds like Skype for business, it's not exactly. "We're leveraging a lot of learnings and technologies and products we have in Skype. It's a similar offering to what we have on the consumer front but it's not quite the same offering. It's the same team that builds both but one is for consumers and the other is for organisations, so there will be the differences between the two that you would expect given the different customer bases." In other words, voice calling for Lync Online isn't just bolting on Skype, and Skype and Lync will continue to be separate services, says Megzec, because there are some ways that home and business users are different. "There are two distinct services, Lync and Skype. One is for enterprise, the other is for consumer and they're connected, so people that are in one can communicate with the other. The consumer offering is free, the business model is ad-led. And it doesn't have a lot of requirements about how I connect it to my Active Directory or to my security and encryption system. For organisations, from an IT perspective all those requirements are super important." When you actually use Skype and Lync, they'll look more and more similar in terms of the interface, to make it easier for users who have both. "The user experience is going to be a lot more consistent between the two. If you're using Skype at home, when you come to work you know natively how to use Lync. We're taking the best of what we know, from Lync and Skype together, so we can enable people to communicate." When Microsoft bought Skype, some people expected it to just become part of Lync. Instead, it's taking advantage of what the Skype team has learnt about making calls and connecting to phone networks, and building that into the Lync service. Parts of the underlying architecture will be the same, and the user experience will feel familiar for both, but the services that sit between the back end and the client you use stay distinct. And the Skype team is also learning from Lync for things like improving Skype messaging. "We've heard a lot of feedback from customers that this is something we need to get better at," admits Megzec, "and we're putting a high priority on that. Now that the architecture work on Skype is done, it becomes easier to make those improvements."